24/05/2018 - DynDevice release 3.1, which includes updates related to the GDPR (and more), now fully distributed on the Mega Italia Media cloud. 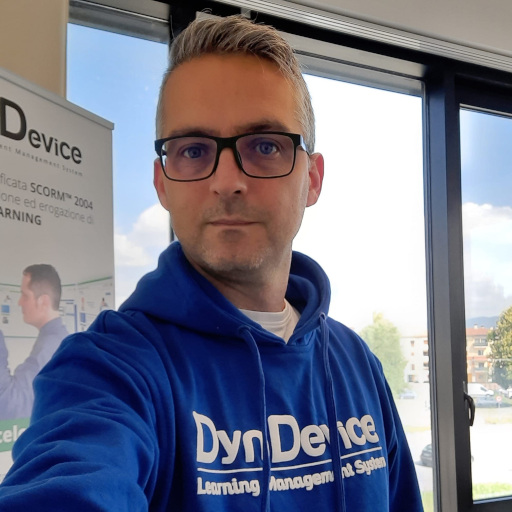 We have just completed the release on the Mega Italia Media cloud of version 3.0 build 000 of DynDevice (training management system), the complete training management system equipped with 6 solutions: e-Learning platform, SCORM™ editor (LCMS with authoring tools), HR management, web content management and company intranet management. Several changes have been introduced with this update, especially but not exclusively in connection to the coming into effect of the GDPR. New/modify user window. The fields "Password" and "Confirm password" have been removed from the window dedicated to the insertion and editing of user accounts with access to DynDevice's control panel. This means that it is no longer possible for administrators to manually set passwords for other accounts: when creating a new user, the system will automatically generate a random password and will send it to the user via email. When editing a user, on the other hand, it will no longer possible to carry out any intervention: the user him/herself will have to change the password via the new procedure that's been added to the login box. Password expiration. A default password expiration period of 180 days has been introduced; when a password expires, on the next access the user will be forced to change it. All passwords have been labelled expired as of this update, and it is therefore necessary for all DynDevice users to set a new password. Rules for new passwords. Passwords are now subjected to rules: minimum length of 10 characters, upper + lower case and at least one number. Requesting a new password. Users can now request a password change from the control panel: by entering the email address they use to access DynDevice, they will receive an email which is valid for 5 minutes and contains a link to generate a new password (which will then have to be changed after the first access). System log. The system log has been enhanced: every action by administrators will now be recorded with its specific GET and POST data. Exporting lists. A new [CSV] icon has been added to all "list"-type windows on the left of the list title. Clicking on it will result in the download of of a CSV file containing all data being displayed at that moment, thereby keeping the filters and order.